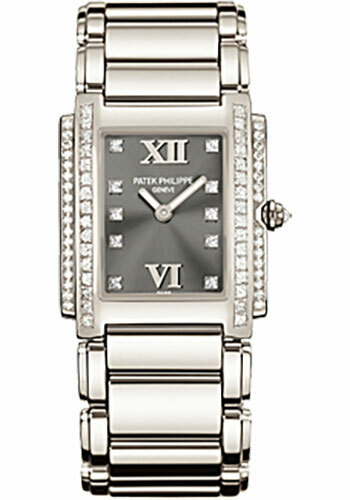 25mm x 30mm 18K white gold case set with diamonds, grey dial, quartz caliber E 15 movement, 18K white gold bracelet. Water resistant to 30 meters. 25mm x 30mm 18K white gold case set with diamonds, diamond set crown, mother of pearl and diamond paved dial, quartz caliber E 15 movement, diamond set 18K white gold bracelet. Water resistant to 30 meters. 25mm x 30mm 18K white gold case fully set with diamonds in a random setting unique to each watch, diamond set crown, diamond paved dial, quartz caliber E 15 movement, diamond set 18K white gold bracelet. Water resistant to 30 meters. 25mm x 30mm 18K white gold case set with 166 diamonds (~1.13 ct.), diamond set crown, diamond paved dial with 147 diamonds (~0.78 ct.), quartz caliber E 15 movement, one black satin strap and one charcoal gray satin strap. Water resistant to 30 meters. 25mm x 30mm 18K white gold case set with 34 diamonds (~0.66 ct.), diamond set crown, eternal gray dial with diamond hour markers and gold applied Roman numerals, quartz caliber E 15 movement, one black satin strap and one charcoal gray satin strap. Water resistant to 30 meters. 25mm x 30mm 18K white gold case set with 34 diamonds (~0.66 ct.), diamond set crown, timeless white dial with diamond hour markers and gold applied Roman numerals, quartz caliber E 15 movement, one black satin strap and one pearl gray satin strap. Water resistant to 30 meters.